The Adamstown strategic development zone (SDZ) planning scheme was adopted in 2003, an ambitious plan to construct Ireland’s newest town. 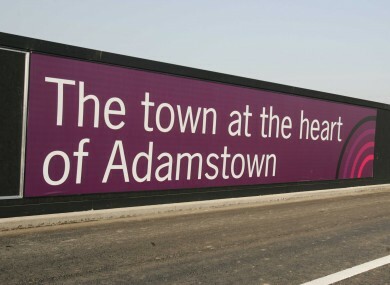 As we know all too well, the global recession coupled with the actions of the Irish banks and government sponsored bailout meant that visionary plans were never completed throughout the country, Adamstown is one of those places. What is disturbing for residents and home owners who bought in Adamstown is that they were led to believe the area would have facilities and services that it is still waiting for. They bought on the promise of a swimming pool, they didn’t get it. They bought on the promise of an increased roads network, they didn’t get it and they bought on the promise of adequate sports and leisure facilities, they didn’t get it. Credit must go to Cllrs Tuffy, O’Connell & Lavelle who encouraged South Dublin County Council to step in and amend the SDZ to help kick-start the development process again. This includes a 20% reduced volume of housing units, down from 10,000. The development of derelict lands at The Paddocks and the opening of alternative roads networks to reduce the bottlenecks currently experienced. The Irish Government is a signatory to the UN Convention on the rights of a child, this means that it must do all in its power to adhere to the articles within the convention. Two of those articles, particularly relevant to Adamstown are “that the best interests of the child must be a primary consideration in all actions concerning children” (Article 3) and “that the child’s view must be considered and taken into account in all matters affecting him or her” (Article 12). A Community centre should be the very heart of a community where people live, it should serve as a hub for communication, lifelong learning and leisure. The absence of a sports hall and a community centre in Adamstown must be seen as the biggest failure of the initial development. While SDCC acknowledges that a sports hall was not in the initial planning agreement between the Department of Education & the developer, I ask the question ‘why not’? Who voted for this development to proceed without explicit direction that these facilities should form a part of the development? Who allowed the development to commence without having he best interests of the child as a primary consideration? Who allowed the development to proceed without regard for the growing numbers of young people in the Lucan area? The fact that Adamstown Community College will have over 900 students in September 2014 and DO NOT have adequate sports facilities is a disgusting example of how developers and County Council did not have the best interests of the child in their thoughts, let alone their development plans. I welcome the revised SDZ plans and I encourage those elected to represent the people of Adamstown, and surrounding areas, to raise this matter on a monthly basis with county management to ensure that South Dublin County Council uses its power to lobby the Department of Education & Skills, along with the site developers to prioritise the provision of essential community infrastructure so as to fulfil our obligations to our young people and ensure that they experience education not only as an activity for the economy, but the enhancement of the physical, emotional and spiritual dimensions of their lives.